Hi friends! Today I wanted to talk to you about Dealspotr. I’ve been using Dealspotr for almost a year now, and it’s been rewarding and a lot of fun! Dealspotr is a money-saving platform where users can post deals, coupons, promos codes and discounts. Dealspotr is a social site, and allows interaction between like-minded money savers. Dealspotr’s website is extremely organised, allowing users to look up deals by category, brand, and even by trending deals. Not only is Dealspotr a great way to save money, but also to make money—Dealspotr rewards users with points for posting, validating and sharing deals. 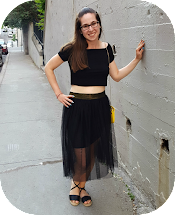 These points are redeemable for Amazon gift cards or Paypal cash for Trusted Influencers. To get started, users must create a profile. Creating a Dealspotr profile is quick and easy. Users can decide if they want to sign up via Facebook or simply with an email address. Once your account is set up, follow stores and interests to customise your feed. Follow other users to stay up-to-date on their newly added deals. When you’re ready, the next step is to post a deal! Simply type in the name of the store, and describe the deal in a few words. Indicate if the deal is site wide, applies to a single brand, and when it expires. Next, you’ll have the option to include a screenshot of the deal (include a screenshot of the sale announcement, or of your checkout screen if you are using the deal yourself) which will earn you more points. Include a tip on how to redeem the deal. The more detailed your tips are, the more points you’ll earn. Posting deals is quite fun and can be addictive! Users each have an accuracy score. 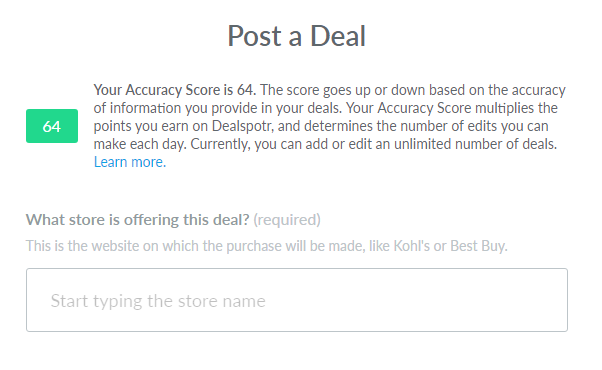 This score is determined by how accurate the deals posted by a user are. A higher the accuracy score means you’ll earn more points for each deal posted. Once users earn 10,000 points, they are able to redeem them for a $10.00 Amazon gift card. Redeeming gift cards is easy. Simply click to submit your redeeming request, and after a short processing period you’ll receive an email with a code valid for the gift card. Why use Dealspotr for Deal Searching and Sharing Instead of Searching for Deals on Google? Dealspotr organizes deals by expiry date. Because users earn points for accuracy, the deals contained on the site are highly accurate. Dealspotr provides users with a personalised deal feed: This means the deals on a user’s feed are actually relevant to them. There is no need to scroll through irrelevant deals! Dealspotr allows users to make money without spending any-users earn points simply by posting deals. If you are interested, feel free to use my referral link to join Dealspotr. After joining and completing your daily checklist, you’ll earn an extra 5,000 points. Thanks for reading, and feel free to ask me any questions in the comments.